These frames may provide extra leverage for you to hold when standing from an armchair, sofa or bed. They usually consist of a metal frame which adjusts to fit under the chair / bed. 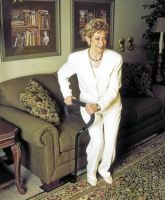 They have one or two handles which extend upwards from the frames to provide support for you to push against when standing or sitting. 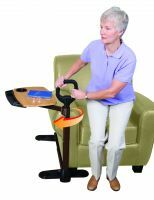 Some have fold-down handles, so you can fold one handle down, turn and put your feet up onto your sofa or bed. You require enough grip in your hands and strength in your arms to utilise the extra leverage provided by the handles on these frames when pushing up from the seat. Consequently, we recommend you arrange an individual assessment. You can contact your local social services and ask about an occupational therapy assessment. You can find their contact details using the www.gov.uk website. 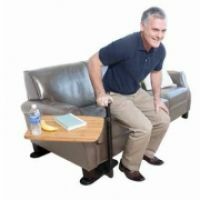 These frames may be particularly useful for standing from sofas as when you are seated on a sofa you can only reach to push up from one armrest. These frames may therefore provide sufficient leverage for you to push up with both arms. 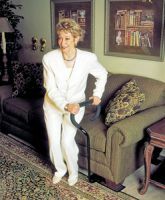 If you would like guided advice regarding chairs then you could try the chair section of AskSARA. AskSARA is the Disabled Living Foundation (DLF)'s free online self assessment tool. AskSARA will ask you questions about your use of your chair and then offer relevant advice, chair related product suggestions and supplier details.